Ya right. I am mad. I am the kind who can watch "You've Got Mail" 5 times and yet still feels a strong urge to want to buy the DVD. I am the kind who can eat Subway's Cold Cut Trio on my every single visit to them and not feel sick of it. In fact, I like it so much that out of the probably 50 times I have been there, there was only once I tried something else. Yes, so, I made muffins again tonight. And it's basic muffins again. You see, I'm trying to find the recipe I really like. The other basic muffin I made the other day, it was nice, soft and moist but still not that right to me. I knew what it was that I was looking for, but I wanted to look around more a nice recipe. Finally, I find it in the most unsuspecting places...from an old recipe book my mother bought for me years ago when she knew I like to bake. I do not like looking at this book because the pictures are not particularly attractive, and I'm a person who MUST look at enticing pictures. Finally, something convinced me to try this recipe..simply because it uses creaming method. 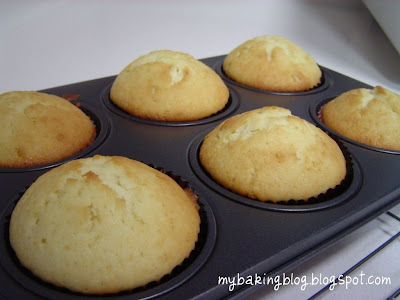 This was how I used to make my banana muffins, instead of using the one-bowl-for-wet-ingredients, one-bowl-for dry-ingredients' "muffin method". This muffin is more crumbly, less moist, and more cake-like, just the way I like it. It's not that muffins made by the other way is not nice. I like muffins made in both ways, just that there is a preference to this. And I know that hubby prefers it this way too, simply because he has been saying that the past muffins I made are too moist for his liking. As much as people always say that muffins are the next easiest things to bake after cookies, I have the tendency to overmix them most of the times. It's only in my recent attempts that I go to the extend of counting my strokes just to make sure that I do not get overindulgent with mixing. The whole muffin recipe is simple, just that the mixing part ironically gives big room for failure. This recipe actually name this Butter Muffins, but really, it's a basic muffin recipe. I added some chocolate chips for 4 of my muffins and next time, I will substitute some flour with cocoa powder for chocolate chocolate chip muffins. I'm pleased with their shape and small little dome. I guess these muffins make me really happy tonight. Unfortunately, my oven's getting aged..and the temperature is getting more uneven, so there are a few of them which are not so evenly browned. I will be posting the recipe soon! Time to sleep now! I've added the recipe to my baking recipes, do check it out! 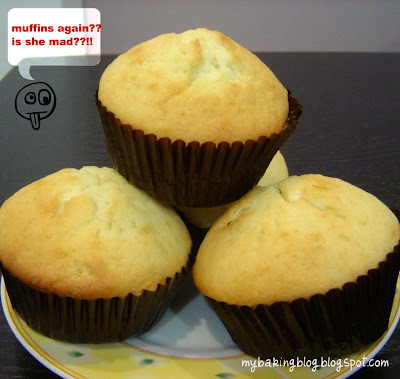 As they say, the old granny's recipes were the best even if it were called butter muffin...today we only improvise on the earlier original versions..i love your muffin and would wait for the recipe. Thansk too, for passing by my blog. I have added the recipe, hope you will like them like I do. Happy 冬至 and Merry Christmas! Ong Lai Tart (aka Pineapple Tarts) - Huat Ah 2011! This work by My Baking Blog is licensed under a Creative Commons Attribution-NonCommercial-NoDerivs 3.0 Unported License. Permissions beyond the scope of this license may be available at www.mybakingblog.blogspot.com. No part of this blog may be reproduced and/or copied by any means without the consent from the blog owner. If you would like to have my pictures or content somewhere else, please be polite to ask or quote the source.